I'm not one who usually writes on these lists, but since it seems like a good way to get others opinions (and ince I've already formed my own), I thought it was a good way to see what others had to say and think. The mobile team for the iOS app (who are all awesome!) has recently released (in beta) a version of the app which incorporates Apple Maps a one of it's main feature, to find articles nearby. "The Wikipedia iOS app has released a beta version (5.4.0 1081) which uses Apple maps as its map data source. This is not an easy decision and has already sparked some discussion of whether this is acceptable given our project's values." These maps are not free (non-libre) and is in my strong opinion against our values. We only create and publish things which are freely licensed (with fair use imagery being the only exception, after a board resolution regarding EDP's). I was asked if we could use non-free elements as long as we said it was non-free and you may not be allowed to re-ue it, and I responded with "If we can't find enough editors for Wikipedia, would it ever be alright if we copied text from Britannica, as long as we said it was from Britannica, and that reusers can not use it" i.e. just because we can't make something, doesn't mean we should use something else (non-free thing) to reach our 'wants', if it causes us to loose what is... 'us'. "An essential part of the Wikimedia Foundation's mission is encouraging the development of free-content educational resources that may be created, used, and reused by the entire human community. We believe that this mission requires thriving open formats and open standards on the web to allow the creation of content not subject to restrictions on creation, use, and reuse. The community will in turn create a body of knowledge which can be distributed freely throughout the world, viewable or playable by free software tools." what a reader is reading? > thought it was a good way to see what others had to say and think. > of it's main feature, to find articles nearby. > 'wants', if it causes us to loose what is... 'us'. > should also have the freedom to fork thanks to freely available dumps. > If the nonfree content is presented as an integral part of the interface, such as inline with the article, that's a problem. It is an "integral part of the interface", so mcu so, it is it's own "thing" in the app, and not part of "in articles". 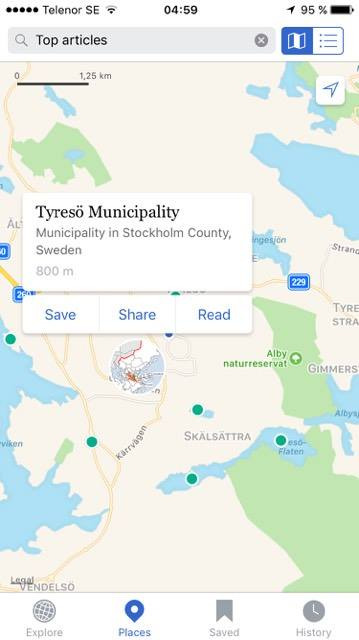 See screenshot (which I can't upload to Commons) here: https://snag.gy/5RpbXZ.jpg It does not just "pull up" Apple Maps, but incorporates in it to the app itself. discussed. Maybe he could help with this aswell? > what a reader is reading? > > thought it was a good way to see what others had to say and think. > > of it's main feature, to find articles nearby. > > 'wants', if it causes us to loose what is... 'us'. > > should also have the freedom to fork thanks to freely available dumps. That link does not for me Jonatan? > interface, such as inline with the article, that's a problem. > just "pull up" Apple Maps, but incorporates in it to the app itself. offer. This was developed at the Hackathon in Vienna.
. It is why Doctors Without Borders use their maps and not others . not developing for the majority of smart phones. now not so good. Including English in China. PS I do have an iPhone. really so hard to predict this difficulty? Who was in charge? > offer. This was developed at the Hackathon in Vienna. > . It is why Doctors Without Borders use their maps and not others . > not developing for the majority of smart phones. > now not so good. Including English in China. > PS I do have an iPhone. methods for replacing those libraries. with a proprietary library in the interim. raised by this email thread. you can track efforts and issues with replacement maps. projects, but rather an app-specific discovery mechanism. geolocation via their iPhone location settings. tracking users over time, and by not building map usage profiles of users. policy , which users must agree to order to use their iPhones. opportunity to engage in a civil discussion about these important issues. > raised by this email thread. > you can track efforts and issues with replacement maps. > projects, but rather an app-specific discovery mechanism. > geolocation via their iPhone location settings. > tracking users over time, and by not building map usage profiles of users. > policy , which users must agree to order to use their iPhones. > the next day or so. > opportunity to engage in a civil discussion about these important issues. OSM where people are actually working hard to provide the best map service. reasons for it. As far as I am concerned you chose to go this way. stayed with Britannica, and skipped that whole Wikipedia nonsense. Apple Maps, it is quite usable, in my experience. (source: used to have iPhone). community. It says "OSM is not good enough (at least for Apple users)"
replace them with Britannica links? All in all, IMHO, the cost is too high for the (at best) flimsy benefits. contrary, it's a significant amount of work. seems like a dangerous and counterintuitive tradeoff to me. tradeoff doesn't seem worth it to me. team working on maps for a couple of months. > stayed with Britannica, and skipped that whole Wikipedia nonsense. > Apple Maps, it is quite usable, in my experience. > (source: used to have iPhone). > community. It says "OSM is not good enough (at least for Apple users)"
> replace them with Britannica links? > All in all, IMHO, the cost is too high for the (at best) flimsy benefits. > > raised by this email thread. > > you can track efforts and issues with replacement maps. > > projects, but rather an app-specific discovery mechanism. > > geolocation via their iPhone location settings. > > policy , which users must agree to order to use their iPhones. > > the next day or so. > > integrating/removing Apple maps. > > opportunity to engage in a civil discussion about these important issues. > > the MediaWiki.org page. This reminds me of en wiki's non-free policy. you will need to jump thru a few more hoops and adds a little more work. > contrary, it's a significant amount of work. > seems like a dangerous and counterintuitive tradeoff to me. > tradeoff doesn't seem worth it to me. > team working on maps for a couple of months. > > stayed with Britannica, and skipped that whole Wikipedia nonsense. > > Apple Maps, it is quite usable, in my experience. > > (source: used to have iPhone). > > community. It says "OSM is not good enough (at least for Apple users)"
> > replace them with Britannica links? > > All in all, IMHO, the cost is too high for the (at best) flimsy benefits. > > > raised by this email thread. > > > you can track efforts and issues with replacement maps. > > > projects, but rather an app-specific discovery mechanism. > > > geolocation via their iPhone location settings. > > > policy , which users must agree to order to use their iPhones. > > > the next day or so. > > > integrating/removing Apple maps. > > > and comment on the phab ticket https://phabricator.wikimedia. > > > the MediaWiki.org page. is superior in places where there is profit to be made from maps. use the Apple maps for a map of the Ottoman empire? technical, for example developing an iOS app or a maps tile service. > is superior in places where there is profit to be made from maps. email, then yes, that may be true. > use the Apple maps for a map of the Ottoman empire? soon, this is very off-topic. > This reminds me of en wiki's non-free policy. > you will need to jump thru a few more hoops and adds a little more work. online encyclopaedia is very different from developing software. sometimes come in to conflict. > technical, for example developing an iOS app or a maps tile service. > > is superior in places where there is profit to be made from maps. > email, then yes, that may be true. > > use the Apple maps for a map of the Ottoman empire? > soon, this is very off-topic. expectations apparently do not have value. knowledge must come first, technical considerations second. > > technical, for example developing an iOS app or a maps tile service. > knowledge must come first, technical considerations second. of the audience and expected impact. That is very basic product management. > further in this thread. this thread. What's being discussed here is very important. >> knowledge must come first, technical considerations second. >Please do not twist my words. I don't see how is that twisting your words. Gerard said that technical considerations should be secondary to functionality and you implied that was not possible without explaining why. The wording in the wiki page does not suggest an "incredibly difficult" technological issue, but more of a political issue (WMF's mapping efforts are in maintenance) and the possibility of minor extra costs for the users (with the possibility of improvement over Apple maps clearly listed). That makes this list the best place to discuss such issues due to the large and diverse audience. > of the audience and expected impact. That is very basic product management. seems that it will have to go unanswered. > The size of your app can significantly reduce downloads . does not sound like a big deal. Agreed, the reference does not look reliable for the claim made. out that the drop in installs was mostly due to negative reviews (since they reverted the app size and the installs didn't climb back up) and the reviews were mostly along the line of "WTF is this simple calculator app a hundred megabytes?". The Wikipedia app is 39MB and the SDK seems to add one MB per  which does not sound like a big deal. inform us how this can be used in Apple maps?